The Flash continues on its lighthearted streak and it’s something that seems to be sticking around, which is good. It’s something that works for the show and proves that there can be stakes without losing that aspect at all. “Elongated Journey Into Night” introduced us to two new characters, one of which was more fun than the other. The episode suffered some missteps in the presentation of Ralph Dibny (Hartley Sawyer), who’s supposed to be a crooked cop-turned good guy. 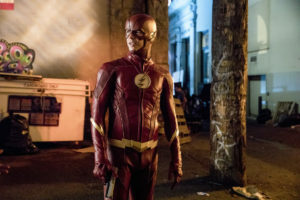 The episode explained some of his backstory, which was really questionable, before turning things around so he could still be well-received and join Team Flash by the end of the episode. This execution threw off a lot of the episode and tied Ralph and Barry’s history up like a loose bow far too quickly. In the spirit of equity and fairness, I’ll begin with everything that “Elongated Journey Into Night” did well. Cisco’s meeting with Breacher (Danny Trejo), Cynthia’s father and boss from Earth-19, doesn’t go very well. To start with, Breacher… breaches in unexpectedly on Cisco and Cynthia (which is now official on the show!) and gives Cisco twenty four hours to essentially run for his life while Breacher hunts him. Cisco tries to hide and outsmart Breacher, but it’s ultimately when Cisco comes to the rescue of his friends that the Earth-19 meta stops trying to hunt him. By being a “steadfast warrior,” Cisco earns the respect of his girlfriend’s hard-to-please and overprotective father. Cisco’s development and subplot with Breacher and Cynthia gave us some of the best parts of the episode. The Jitters scene between him and Breacher was very reminiscent of Barry and Earth-2 Joe. 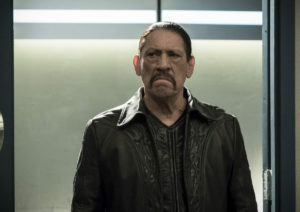 The Flash has an overprotective dad syndrome, it seems (Joe, Harry, now Breacher), but it’s played up for laughs here and hopefully we’ll be able to get to see Danny Trejo again soon. Cisco has come a long way as a character. I’d go as far to say he’s the third-most developed character behind Barry and Iris. Seasons one and two gave us a lot of sidekick, humorous Cisco, but for a long time, that’s all he was relegated to. So I’m enjoying the development he’s getting outside of his duties at STAR Labs. 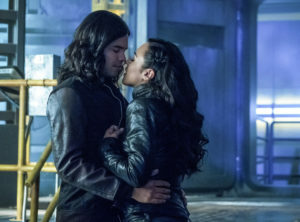 Romantic Cisco is a breath of fresh air and, while we’ve gotten to see him be flirty before, he’s never been in any long-term relationship on the show and it’s done wonders for him as a character. As usual, Carlos Valdes sells it and gives us nervous, scared, and heroic Cisco all in one episode. The season’s plot is playing out beautifully so far. There’s mystery and intrigue in each episode and it’s refreshing that the writers are dropping in clues and revealing information as the season progresses. It’s almost like the Thinker is the writers who know what is going to happen and are setting everything up. Meanwhile, Barry and co. figuring out clues along the way instead of being left in the dark has been lovely to see. Every episode has tied into the next and every metahuman is a part of the bigger picture. All of this makes for highly entertaining television and a Barry who will hopefully be on top of his game this season instead of an immobile pawn like seasons past. DeVoe’s name was revealed and it’s a name Barry remembers from season three, having been mentioned by both Savitar and Abra Kadabra. It’ll be interesting to see what actions Barry, Iris and the rest of the team take in order to find out what’s going on. The shady mayor plot was well done. It easily sets up a new subplot that could continue throughout the season and have it circle back to The Thinker and even CCPD. Especially since Mayor Bellows and Dibny tie back to DeVoe, who seems to have wanted Barry to ultimately find out his identity all along. All the pieces of the puzzle are falling into place and Bellows took up too much time in the episode and interacted with Barry and Joe enough for him to warrant coming back to the show and causing some kind of dilemma. It’ll be interesting to see exactly what the show might have in store for him within the story. The episode banked on several leaps of faith. The biggest one being faith in the audience to care about Dibny, especially after the reveal about him tampering with evidence. It’s something that was never clearly explained–Ralph did it because he knew the man was guilty and didn’t want him to be set free? What if he wasn’t actually guilty? Why should we believe Ralph? It’s asking too much of us to put our trust in a stranger who suddenly finds himself working with the team and who isn’t exactly the nicest of guys. Caitlin defends him and, while she makes somewhat of a valid point about suddenly finding yourself with powers and not knowing what to do, it seemed more like she was talking about herself. Like she was asking to be pardoned, for understanding, even though she’s still lying to Team Flash about no longer having her powers and having “changed,” so her argument is lacking and therefore easily dismissed. The writing made it hard to love Ralph. His jerk level is high and the non-resolution to the story regarding the case from five years ago sits heavy in the episode. Barry has a change of heart and, while it’s in character for him to give people second chances (and apparently revealing his identity to every single one of them), it came far too quickly. If nothing else, it proved that conflict resolution on this show is too easily solved and problems are often brushed aside and forgotten. It would have also been nice to have a smart-mouthed character who isn’t on the team and is rather causing trouble at CCPD or at crime scenes. After all, we already have one smart-mouth and his name is Wells. At the end of the day, the writers could’ve made Dibny’s backstory less problematic if they’d intended to move past it so quickly. The only major good to come of Barry’s interactions with Ralph, besides some humor, is having Barry question his own morals. Back in season one, Team Flash was locking up metahumans in the pipeline without trial or anything. While one of the shadier aspects of season one and something the show corrected by giving Iron Heights a metahuman wing, is comparing it to a detective knowingly planting evidence to convict someone the same thing? Most of the metahumans that were locked up had already done bad things and hurt people. I’m willing to give Dibny the benefit of the doubt, but this little backstory tidbit is still bothersome. Admittedly, Barry was letting his hatred of Dibny cloud his judgment and wanting to throw him into a cell before he even did anything was pushing it, but he was right to question Dibny given the reasoning behind his dislike. Quite frankly, the team has become far too lenient when it comes to… well, everything. Barry reveals his identity too easily, he decides to trust Ralph too easily, the team will take on a new addition far too easily. There isn’t enough conflict with outside characters because everyone ends up joining the team at some point and it’s exhausting. This is especially most noticeable so soon after Wally’s departure. Just last week, Wally was saying that he didn’t feel useful to the team and that no one noticed he’s gone. And now, Barry is so gung-ho about training a new person when he could’ve been working alongside, and teaming up with, Wally? It just doesn’t sit well at all and feels like it’s too much, too soon. The baby stuff and reveal felt out of place and strangely executed. The cigar scene would have worked better as a West family home moment, and one which included Cecile. Joe’s shock regarding the surprise pregnancy news seemingly wears off, but he’s still spooked and defensive every time someone tells him he’s glowing (really?). This continues until he finally, and abruptly, comes clean to Barry near the end of the episode and it’s followed by one of the strangest sequences that The Flash has ever done. It wasn’t awful or anything, but simply off-putting with where it came in the episode, the presentation, and the location of the reveal. Could this moment not have been a heartfelt scene at the end of the episode, with Joe telling Barry and Iris privately? The congratulatory cigar announcement could’ve stayed so long as the scene was done a bit more justice, but alas. Ultimately, “Elongated Journey Into Night” is the weakest episode of season four thus far. It was fun in certain respects, but between the introduction of Dibny and Breacher, Dibny got far too much focus even though Breacher was the better of the two. 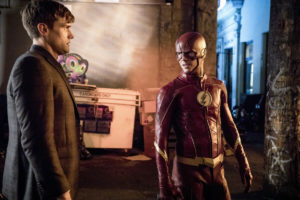 The episode brought up an interesting perspective regarding how Team Flash has treated metas in the past, but is Dibny’s transgression as a detective the same thing? The episode would have been improved had there been more of an explanation. Barry’s propensity to give second chances has gotten the team in trouble in the past and Caitlin defending Dibny didn’t work either because she herself committed the biggest transgression of all last season and is still lying to the team. If this was just the case of Dibny being a jerk and Barry not liking him because of that, then it would have been easier to get on board the second chance train. Being a metahuman doesn’t immediately make someone evil, true, but Dibny’s questionable actions pre-date his newfound abilities and allowing him to immediately join the team so soon after Wally’s exit makes the entire situation worse. “This facility is poorly guarded.” Breacher had a great introduction. And you’d think after all these years, STAR Labs would have better security, but I guess Barry can’t afford that. I feel I was too hard on Ralph, but he’s a pest so far. We’ll see where this goes. The three magical relationship words for Cisco are “What’s your name?” Ha! Joe finally puked after four years of crazy. But stretchy arms is the thing that broke him. Would Barry have given a second chance to anyone who had he planted a knife at the scene of his mother’s crime? Nope, didn’t think so. Hours later and that baby reveal scene is still bizarre. Cisco’s hair being all bouncy even as he’s prepared to run for his life is my new aesthetic. Barry and Iris investigating together is what dreams are made of. We definitely need more of this on the show. “You look like someone I sent my daughter to kill.” RIP HR. Why did they keep saying that Dibny had gained weight? Was that necessary? Wally leaves because no one has time for him, but Barry suddenly has time for training Dibny. Way to go, show. Yes, I’m bitter. I still don’t know how much I buy Iris not knowing who Dibny is. He clearly knew who she was and we’ve seen Iris hang out at CCPD even before the particle accelerator explosion. I feel like this was used for exposition, unless Barry’s feathers were so ruffled he never talked about it because of the case. Hmm. Hartley Sawyer kind of reminds me of Jim Carrey. Anyone agree? Seriously, does Barry have to reveal himself to everyone so quickly? It’s becoming exhausting at this point. What’s the point of a secret identity if everyone and their mothers knows who you are? Joe’s stunned expression and speechlessness to this week’s joy in that reveal scene gave me whiplash. Cisco and Cynthia are the cutest. Danny Trejo is a great addition to the show. Harry being unbothered even as Cisco tries and hides was chuckle-worthy. 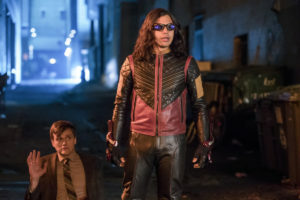 The episode explained some of Ralph Dibny's backstory, which was really questionable, before turning things around so he could still be well-received and join Team Flash by the end of the episode. This execution threw off a lot of the episode and tied Ralph and Barry’s history up like a loose bow far too quickly. The weight thing? I thought it was to make the Dibny’s abs gag pay off. Also, “Cecile’s pregnant” couldn’t have come at a better time. The reveal was unexpected, throwing us as off-guard as Barry is upon hearing the news. I thought it was one of the more hilarious bits of the episode. But yeah – Barry revealing himself to too many people is getting a little disconcerting. Is this part of his new post-speed force personality?